It is now a legal requirement that all new non-domestic buildings with more than one storey, must provide a safe ‘refuge’ area for disabled people who are unable to exit a building using the dedicated escape routes. Emergency Voice Communication Systems must be installed to allow two-way communication between the fire service/building management and the people in the refuge area to aid a safe evacuation. Cintrix Systems can supply, install, commission and maintain fixed, secure, bi-directional, full duplex voice communication systems to assist fire fighters in an emergency, especially on sites where radio communication may be restricted. 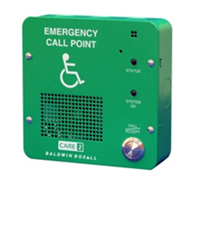 Our systems cover the operation of both fire telephones and disabled refuge systems and comply with BS 5839-9. Regular maintenance and testing of disabled refuge equipment is not only important for your business but is now a legal requirement. It is vital that regular testing be undertaken to ensure that there has not been a major failure of the system that may otherwise go unnoticed. BS 5839-9 (the code of practice for the design, installation, commissioning and maintenance of emergency voice communication systems) recommends that the period between visits to undertake inspection and service of fire detection or fire alarm systems should be based upon a risk assessment, but the maximum period between visits should not exceed six months. BS 5839-9 also recommends that the inspection and servicing should be undertaken by competent organisations.